Chocolate n’ White Chip Cheesecake | Rosetta Bakes! Sift flour, baking soda and salt together and set aside. Cream butter and both sugars till smooth, add vanilla, add eggs (one at a time) beating well after each addition. Gradually beat in flour mixture. Stir in chocolate chips, white chips, chocolate chunks and nuts. Once the recipe is made, divide in half. One half will go in the bottom and the other half will go on top. 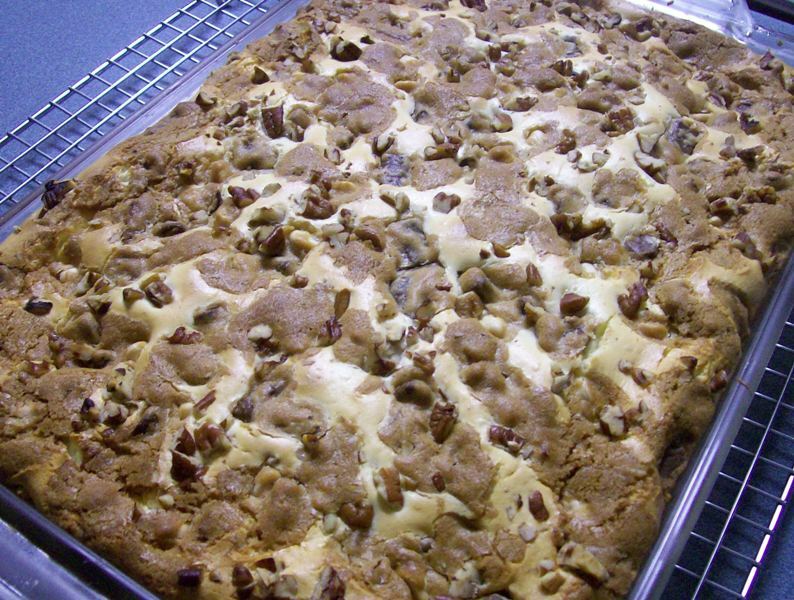 Press half of cookie dough into an Un-greased 9 or 8 inch baking dish or pan. Dough will be sticky so you can lightly flour your fingers (this will help it not stick as much). Press evenly into the pan. Next, make the cheesecake to go on top of cookie dough in pan. Mix the cheesecake ingredients well and pour on top unbaked cookie dough in pan. Crumble the other half of cookie dough on top. Crumble a little at a time because it’s so sticky. Do not put it on thick, you can use any left over dough to make a few cookies. Just scatter it around all over but do not smooth it out. I chopped a few extra pecans and sprinkle then all over the top. Bake cheesecake at 375 for about 35 to 40 minutes. When it comes out of the oven, set it on a cooling rack to cool for 1/2 hour, and then place in refrigerator for 2-3 hours before cutting…it needs to be chilled well to set up.